A.G.U. Perera, Physics and Novel Device Applications of Semiconductor Homojunctions. R.P.G. Karunasiri, J.S. Park, and K.L. Wang, Progress of SiGe/Si Quantum Wells for Infrared Dectection. S.D. Gunapala and K.M.S. Bandara, Recent Developments in Quantum-Well Infrared Photodetectors. K.K. Choi, Multiquantum-Well Structures for Hot-Electron Phototransistors. J. Nelson, Quantum-Well Structures for Photovoltaic Energy Conversion. References. Author Index. Subject Index. Physics of Thin Films is one of the longest running continuing series in thin film science, consisting of twenty volumes since 1963. 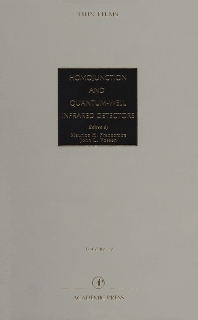 The series contains quality studies of the properties of various thinfilms materials and systems. In order to be able to reflect the development of today's science and to cover all modern aspects of thin films, the series, starting with Volume 20, has moved beyond the basic physics of thin films. It now addresses the most important aspects of both inorganic and organic thin films, in both their theoretical as well as technological aspects. Therefore, in order to reflect the modern technology-oriented problems, the title has been slightly modified from Physics of Thin Films to Thin Films. Researchers in electrical engineering, condensed-matter physics, and materials science. All academic and industrial thin film researchers. Georgia State University, Atlanta, U.S.A.